GROOTS Kenya in partnership with Equal Measures 2030 is working with grassroots women and relevant stakeholders in Kenya to advocate for gender responsive Medium Term Plans and County Integrated Development Plans. Both the MTP111 and CIDPs are currently under development. Gender Equality Champions trained under this project are spearheading community-led monitoring of the implementation using an agreed set of indicators. To kick start the project, GROOTS Kenya developed the SDGs Monitoring Framework to equip grassroots women and their communities with the capacity and evidence to monitor progress on the localization of agenda 2030 by national and local governments with a key focus on gender equality. 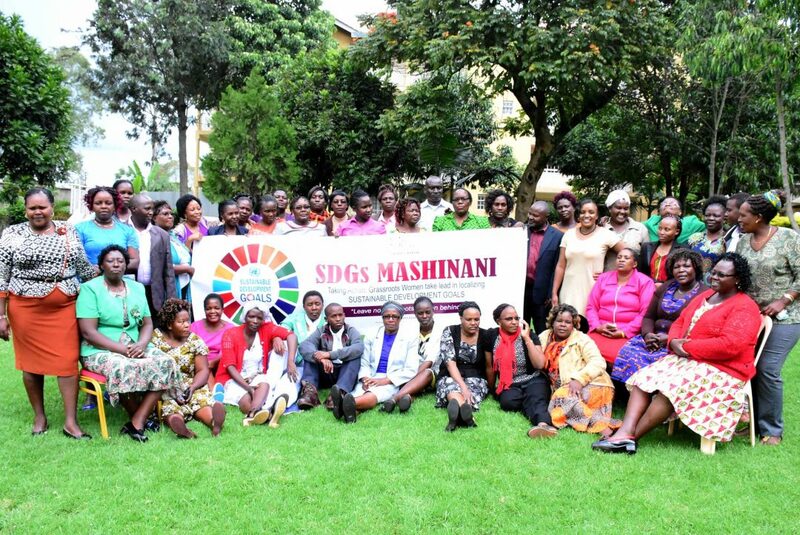 GROOTS Kenya further trained 42 trainers of trainers who will in turn train other community members on the SDGs to create a critical mass of gender equality champions in Kiambu, Kakamega and Laikipia Counties. The champions have already selected 12 goals, 23 targets and 25 indicators to monitor, against the 17 global goals, 169 targets and 232 indicators. Their selections are based on the priority needs within their communities. The data collected will be the basis on which the advocacy begins.